Not to be confused with Films of The Church of Jesus Christ of Latter-day Saints, which are films commissioned by or officially produced by the LDS Church. Mormon cinema (informally Mollywood, a portmanteau of Mormon and Hollywood) usually refers to films with themes relevant to members of The Church of Jesus Christ of Latter-day Saints (LDS Church). The terminology has also been used to refer to films that do not necessarily reflect Mormon themes but have been made by Mormon filmmakers. LDS cinema films might be considered distinct from LDS Church movies like Legacy and Testaments, since they are commercial and not produced for teaching or proselytizing LDS doctrine. LDS cinema is usually produced and directed by Latter-day Saints. The films typically have LDS themes and are often marketed especially toward Latter-day Saints, though there has been an effort to "cross over" into more mainstream themes. Films about Latter-day Saints are nothing new. 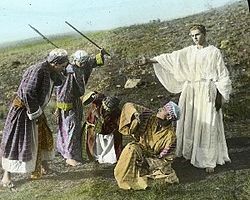 The LDS Church sponsored the production and release of the feature-length films One Hundred Years of Mormonism (1913) and The Life of Nephi (1914). Films about Mormons, especially lurid pulp fiction-inspired tales of hypnotic missionaries and Western pioneer stories, were a staple of the early silent, black and white film era. With films made primarily by LDS filmmakers for an LDS audience, the "LDS Cinema" movement is distinct from the broader use of Mormon characters in mainstream Hollywood films. The "LDS Cinema" movement began around 1999, when Richard Dutcher's company, Zion Films, released God's Army commercially. The film, which was produced on a budget of $300,000, grossed about $2.5 million at the box office and many more millions of dollars worth of video purchases. Observing the market success of God's Army, many other LDS studios began producing films. Although God's Army dealt with the overtly religious subject of LDS missionaries, and many LDS comedies are sometimes incomprehensible to people outside the LDS Church, a growing trend moves toward making LDS-themed movies more broadly accessible. The acclaimed World War II movie Saints and Soldiers is perhaps the most successful crossover LDS film to date. More accessible films have been thought by some as likely to ensure larger potential markets. However, "accessibility" has not necessarily translated into greater box office earnings or critical acclaim than achieved by the more "insider"-oriented LDS Cinema films. LDS comedies in particular have been panned by critics, who have branded most efforts thus far inaccessible and unfunny to those outside the intended market. Such movies have frequently been perceived as overly reliant upon the audience's extensive knowledge of LDS practices and LDS cultural norms. One aspect of the culture of LDS cinema is heightened concern over MPAA film ratings. Many Mormons feel disinclined to view movies rated R, so LDS film producers risk greatly diminished revenue for exceeding a PG or PG-13 rating. One PG-13 film, The Book of Mormon Movie, Vol. 1, gained its rating for depicting a decapitation that occurs in the Book of Mormon. Producers defended the scene as essential. Some critics[who?] leveled a common complaint about the MPAA – that it awards a higher rating to movies not produced by the major film studios. Nonetheless, producers re-edited the movie to earn a PG rating for DVD distribution. Another film, Saints and Soldiers received an R-rating prior to film festival screening. Producers edited the movie to receive PG-13 for commercial distribution. Brigham Young (1940) – Follows the story of Brigham Young after Joseph Smith's death. Bad Bascomb (1946) – Two outlaws hide out in a Mormon wagon and one of them befriends a little girl. Wagon Master (1950) – Forced out of Crystal City, a group of Mormons head west in search of the promised land. Paint Your Wagon (1969) – Two unlikely prospectors share the same wife in a Californian mining town. Messenger of Death (1988) – A film about an attempt by a water company to start a family feud among fundamentalist Mormons to take the family's land for the company. God's Army (1999) – The first general release, modern Mormon cinema film, about LDS missionaries; directed by Richard Dutcher. Brigham City (2001) – A murder mystery, also by Dutcher. The Other Side of Heaven (2001) – Not by an LDS studio. Although special pains were taken to remove overt LDS references, it is often counted as LDS cinema because it was brought to fruition by an LDS producer, and is based on John H. Groberg's experiences in Tonga as a LDS missionary, as documented in his memoir In the Eye of the Storm. The Book of Mormon Movie, Vol. 1: The Journey (2003) – An ambitious film about the Book of Mormon, which was the fourth highest-grossing movie in LDS cinema. The Best Two Years (2003) – An LDS missionary's experience in the Netherlands, based on the play The Best Two Years of My Life. Saints and Soldiers (2004) – A World War II movie that has muted LDS overtones and significant mainstream appeal. The Work and The Glory (2005) – Based on Gerald Lund's LDS and historical fiction series The Work and the Glory. The Errand of Angels (2008) – The experiences of a female LDS missionary from Idaho serving in Austria. Emma Smith: My Story (2008) – The story of Joseph Smith's wife, Emma. Based upon the true story of her life. The Saratov Approach (2013) – Based on the true story of two missionaries kidnapped and held for ransom while serving LDS missions in Russia in 1998. Wayward: The Prodigal Son (2014) – After asking his father for his inheritance, a careless wanderer loses everything in life and tries to forgive what he's done. Freetown (2015) – Based on the true story of a group of native Liberian missionaries traveling from Monrovia, Liberia to Freetown, Sierra Leone during a time of civil war in 1990. The Cokeville Miracle (2015) – based on the true story of the Cokeville Elementary School hostage crisis and the miraculous spiritual experiences that happened there. Just Let Go (2015) – Based on the story of Chris Williams who forgives a young man after they each faced a devastating incident. Saturday's Warrior (1989) – Popular release among Latter-day Saints of the De Azevedo and Stewart musical, directed by Bob Williams. De Azevedo released a remake of the movie in 2016. Out of Step (2002) – A young dance student leaves Utah for schooling in New York City. She falls in love with two different men and must choose between them. Charly (2002) – A movie, based on a book by the same name written by, Jack Weyland; about a man who has all of his life planned. His belief, and life. It all changes when a girl walks into his life and changes it. Pride and Prejudice: A Latter-Day Comedy (2003) – Modern adaptation of the Jane Austen novel Pride and Prejudice, set in Provo, Utah. Several comedies, mostly produced by Dave Hunter, have also been released. Because the humor of these films often relies on specifically Utah-centric Latter Day Saint culture, they tend to have a smaller audience than the other LDS subgenres, even among Mormon viewers. The Singles Ward (2002) – The title refers to an LDS congregation (ward) composed only of single adults. A comedy with romantic aspects. The R.M. (2003) – About the experiences of a returned missionary. The Best Two Years (2003) – LDS missionaries' experiences in the Netherlands, based on the play The Best Two Years of My Life. The Work and the Story (2003) – A mockumentary about LDS cinema when Richard Dutcher (fictionally) disappears. Written, produced and directed by Nathan Smith Jones; co-produced by Miriam Smith. The Home Teachers (2004) – Slapstick comedy about polar opposite home teachers that "fulfill" their responsibility on the last day of the month. "Home teaching" is the LDS practice of a home teaching companionship – a holder of the Melchizedek Priesthood and a 14-year-old teacher or older – visiting and teaching families in their ward each month. Baptists at Our Barbecue (2004) – Longfellow – consistently called "Longwinded" by the inhabitants – is a small town that is religiously divided equally between Baptists and Mormons. A newcomer becomes the tie-breaker. Rather than tilt the scales he decides to bridge the religious divide by organizing an all-faiths barbecue. Based on a novel by Robert Farrell Smith. Sons of Provo (2004) – Mockumentary about an LDS boy band named Everclean. Mobsters and Mormons (2005) – After testifying against his mob boss, Carmine "The Beans" Zindelli Pasquale and his family are put in the Witness Protection Program in "Happy Valley", Utah, resulting in significant culture clash. Church Ball (2006) – In the last year of a basketball league, a church team does not want to place last again. The storyline juxtaposes the desire to win at all costs with the expectation of sportsmanlike conduct in church sports. Inspired Guns (2014) – Two Mormon missionaries begin teaching two members in the mafia in a case of mistaken identity. Once I Was a Beehive (2015) – A non-LDS girl attends Young Woman's camp. Passage to Zarahemla (2007) – A time-travel adventure set in the rural area of Leeds, Utah wherein characters from modern times interact with Nephites and Gadianton robbers (tribes and groups mentioned in the Book of Mormon). 17 Miracles (2011) – Based on accounts of the pioneers of the Willie and Martin handcart companies struggling to survive to head to the Great Salt Lake Valley while a multitude of miracles occur. Ephraim's Rescue (2013) – Prequel/parallel to 17 Miracles. The story of Ephraim Hanks, who joins the LDS church and miraculously saves the Martin handcart company. 16 Stones (2014) – A young man and friends set out on a dangerous quest to retrieve the 16 stones of the Jaredites to prevent others from future mob persecution. American Mormon (2005) – A small film crew drove across the United States interviewing people about their perceptions of Mormons. New York Doll (2005) – A recovering alcoholic and recently converted Mormon, Arthur "Killer" Kane, of the rock band The New York Dolls, is given a chance at reuniting with his band after 30 years. American Mormon in Europe (2006) – Interviews with people in Europe about their perceptions of Mormons, and interviews with European church members. Happy Valley (2008) – Documentary about prescription and street drug abuse in Utah County, Utah. Us and Them: Religious Rivalry in America (2013) – A documentary about a Mormon finding answers between his religion and Christianity feuding for the belief in God. The Joseph Smith Papers (2008–2009) – Documentary television series which documented the creation of, and work involved in, Joseph Smith Papers Project. History of the Saints (2010) – Documentary television series which focuses on the history of the Latter-day Saints after the death of Joseph Smith, including their exodus to Utah. Hell on Wheels (2011–2016) – Western television series which focuses on the building of the Transcontinental Railroad. ^ "Films Made by Latter-day Saints - Box Office Receipts Compared". www.ldsfilm.com. ^ "Coming Soon - Future home of something quite cool". www.happyvalleythemovie.com. ^ "Meet the Mormons". Meet the Mormons. ^ "Book of Mormon Movie (2003) - Box Office Mojo". boxofficemojo.com. ^ a b "1984 Yearly Box Office Results - Box Office Mojo". boxofficemojo.com. Astle, Randy; Burton, Gideon O. (2007). "A History of Mormon Cinema". BYU Studies. 46 (2]): 12–163. Astle, Randy (2013). "Mormons and Cinema". In Hunter, James Michael. Mormons and Popular Culture: the global influence of an American phenomenon. Santa Barbara, California: Praeger (ABC-CLIO). ISBN 9780313391675. OCLC 776495102. Baggaley, Thomas (2004). "LDS Cinema Gets Better and Gets a Bum Rating". Meridian Magazine. Archived from the original on 2010-02-02. Halter, Ed (January 13, 2004). "Missionary Positioning: Indie Mormon Cinema Attempts a Mainstream Conversion". The Village Voice. Samuelson, Eric (2007). "Finding an Audience, Paying the Bills: Competing Business Models in Mormon Cinema". BYU Studies. 46 (2): 209–230.